Perfect new condition packaged well. Thank you! Super fast shipping. Perfect! Just what I was looking for! THANKS! A+++ vendor quick delivery THANK YOU! Took 3 weeks to get. The item was supposed to have been delivered in two days but took about a week. Lost 1st order. Sent reorder at higher price. Still waiting for item. Waiting to hear from seller. We have made pot roast, hard boiled eggs, chicken alfredo, steamed potatoes, and the list goes on. It is easy to use, lots of recipes on line, doesn't heat up the house in the summer time and is so much faster than cooking on the stove top. We can buy cheaper cuts of meat and they all come out tender and fall off the bone. You can invent your own recipes after you get the hang of the cooking times (half the time or less than conventional) and you don't have to worry about watching it or it burning. All the vitamins and nutrients are sealed in when you use it. Shoot, I would have bought it just for making hard boiled eggs so easy to peel. Just buy it and never look back. I thought an Instand Pot would be a great Christmas present and this one arrived on time but with a huge dent in the side of it. Embarrassing to have sent that to someone. Not sure what to do now. I love the fact after a hard and long day at work, dinner can be ready in minutes using the pressure cooker. Or just knowing dinner will be ready when I get home using the slow cooker. 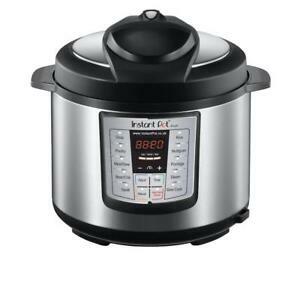 I just love this pot I have used pressure cookers before the old ones you have to watch, this Jewell you set it and go about your business it's great Roy ...... in VA.